Information: This photograph of the southern hemisphere of Jupiter was obtained by Voyager 2 on June 25, 1979, at a distance of 12 million kilometers (8 million miles). 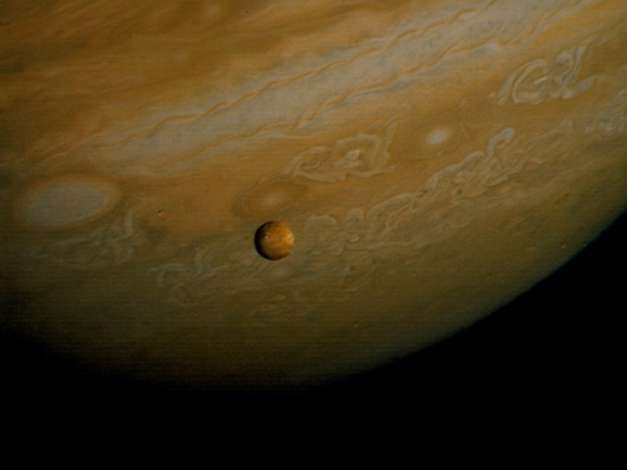 The Voyager spacecraft reached its closest approach to the giant planet at 4:23 p.m. PDT on July 9, 1979. Seen in front of the turbulent clouds of the planet is Io, the innermost of the large Galilean satellites of Jupiter. Io is the size of our moon. Voyager discovered in early March, 1979 that Io is the most volcanically active planetary body known in the solar system, with continuous eruptions much larger than any that take place on the Earth. The red, orange, and yellow colors of Io are thought to be deposits of sulfur and sulfur compounds produced in these eruptions. The smallest features in either Jupiter or Io that can be distinguished in this picture are about 200 kilometers (125 miles) across; in this resolution, it is not yet possible to identify individual volcanic eruptions.